Step out from tradition with Vera in black. Vera a stunning vision in black watch heads turn and know you have the wow factor. Vera not only comes in Black but Ivory and white as well. 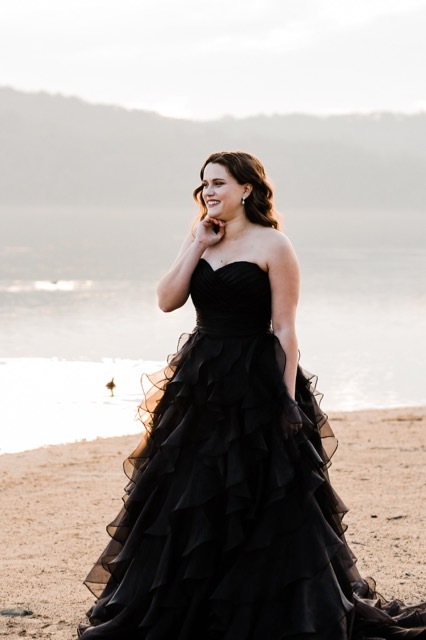 With a sweetheart neckline and gentle organza ruffles throughout the skirt I also love that this dress suits every size. From a size 6 to a size 32 it pulls in the waistline and gives you an amazing shape, a heavily boned bodice helps with supporting you thorough out the night. 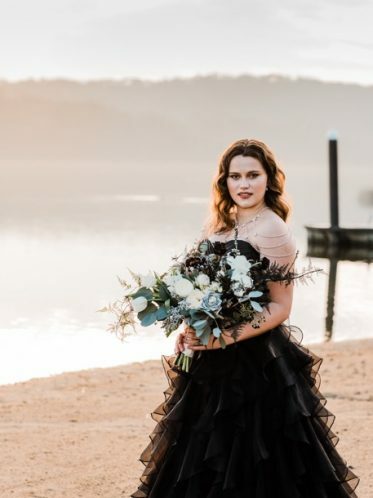 Vera Black Wedding Dress features. I matched our Mystic pearl wedding earrings on Rochelle for the Couple’s by the lake campaign with a pearl shoulder necklace. Why not add a silver wedding necklace or a vintage style hair comb to finish your look. 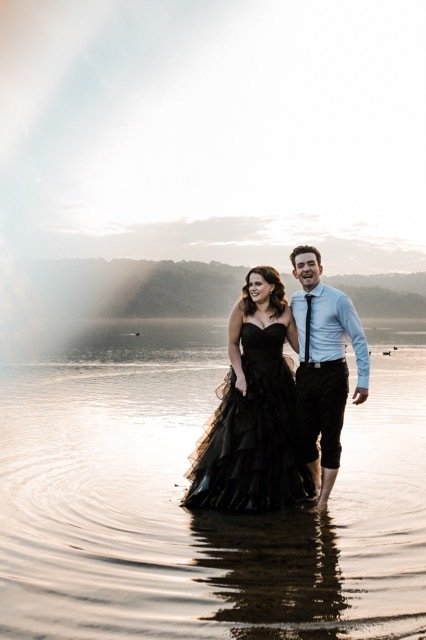 Worried about alterations? Don’t be, we have on site alterations. 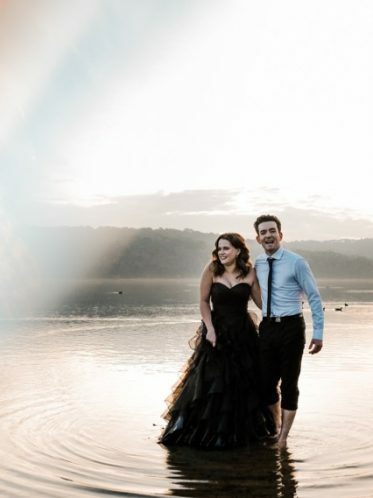 Our alterations department can shorten you hem line, down size your dress up to two sizes and bustle your train if you wish. We can talk more about alterations in store and give you a price list if you like. 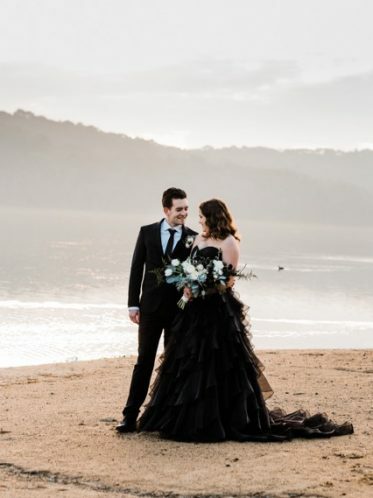 Black wedding dresses also white and ivory. The stunning Vera bridal gown is also available in white and ivory for the more traditional bride. We recommend a sequin trim veil with enough length to form a cascade to compliment the skirt design. 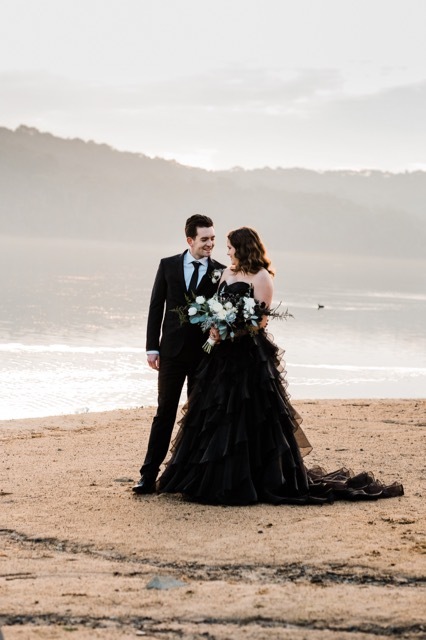 Black veils can be made to your requirements at Leah S Designs even a black wedding veil is available to go with black bridal gown Vera. 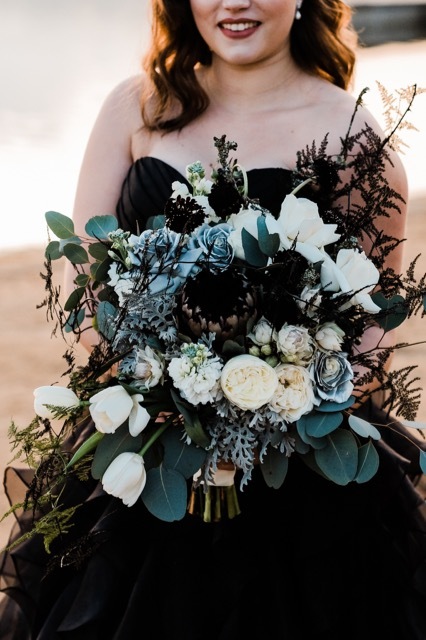 What colour wedding flowers compliment a black wedding dress. You are only limited by your imagination. You could use bold strong colours. Pastels will look just as good. In this photo shoot we have used a soft green foliage and cream and pale blue roses to compliment the grooms shirt. However a deep red and ivory bouquet would be very dramatic too. 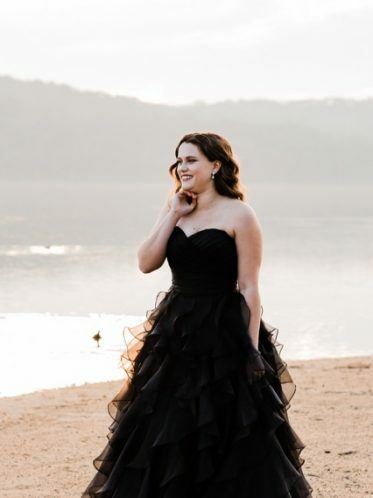 Bridesmaids dresses that go with black wedding dresses. 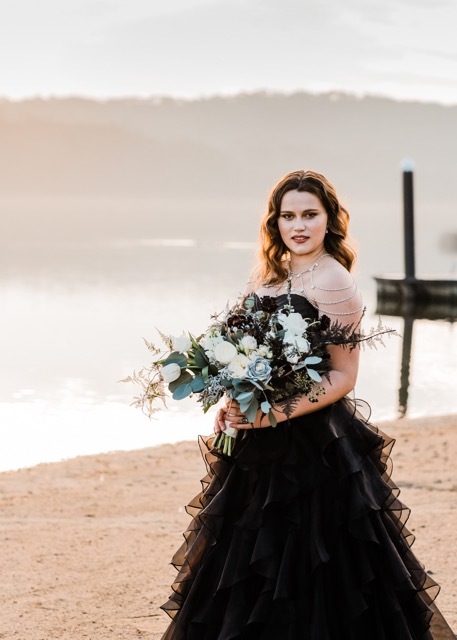 Consider your bridal theme when choosing bridesmaids dresses and your bridal bouquet. Plus purple flowers are quite easy to find no matter what the season. These freesia flowers pictured above will give a beautiful scent too. However if you suffer hay fever maybe choose a gerbera. 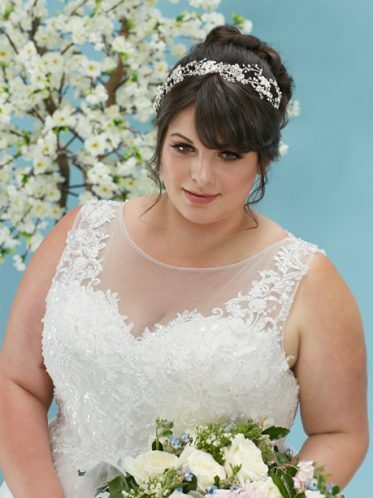 You can add a sparkling bridal belt to your Vera gown. 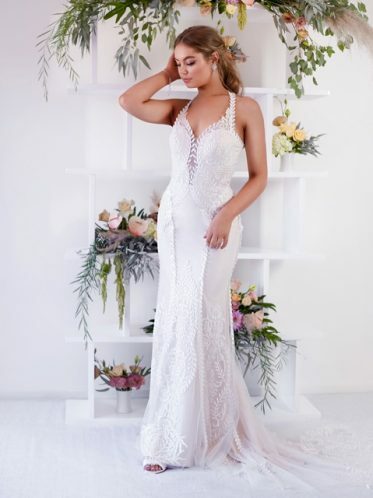 We recommend you try one on when visiting our Melbourne bridal shop. 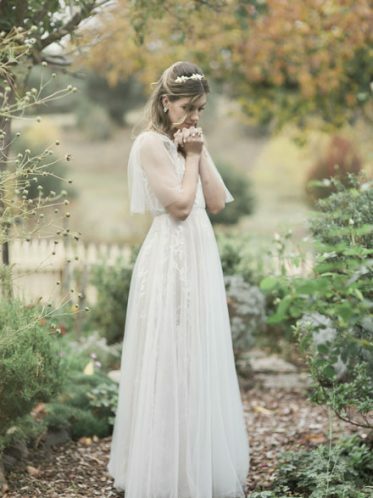 It’s amazing how the simple addition of a wedding dress belt can dramatically change the look of a gown. 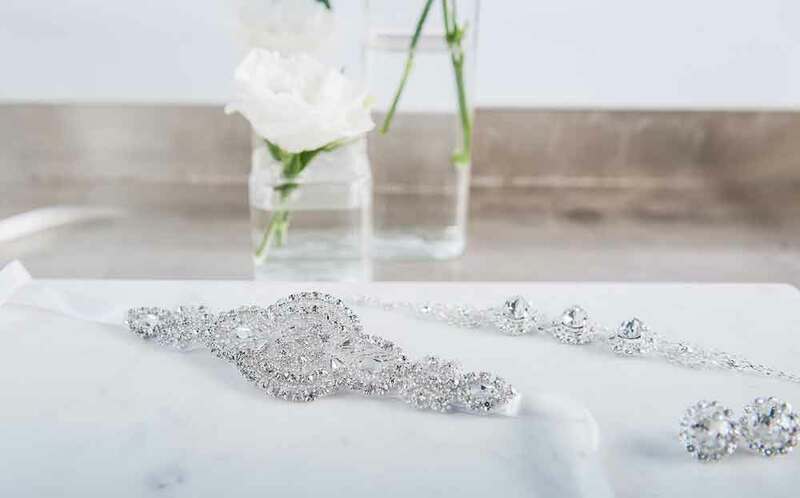 Team some sparkling wedding jewellery to your belt to complete your look.